Shield all types of leather with just one application! Due to constant exposure to harsh elements, your leather surfaces, if left untreated, tend to fade and wear quicker than other sections of your car. The rubbing of your pants or jeans on the seat, harsh UV rays, spilled drinks and food all cause staining, drying, scarring, and a general fading. Properly cared for leather is easier to maintain, so make sure you protect from the beginning with GYEON Q2 Leather Shield! GYEON Q2 Leather Shield uses an advanced SiO2 (silicon dioxide) based formula, specifically developed for automotive leather interiors. This specialized formula creates a strong barrier between your leather and harmful elements that cause degradation. GYEON Q2 Leather Shield is very easy to apply, requires only one application for supreme protection, and will not alter the look or feel of your leather surfaces. For a shielded, matte leather surface, GYEON Q2 Leather Shield is perfect! 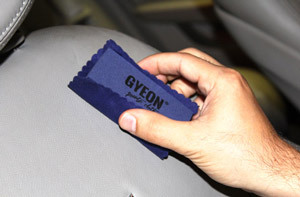 GYEON Q2 Leather Shield is very easy to apply! 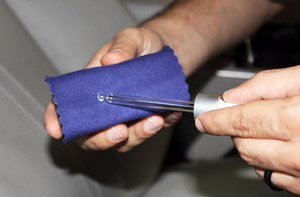 First, be sure your leather surface is cleaned using a dedicated leather cleaner. Apply a few drop of product ontot the suede microfiber towels included in the kit and use the included applicator to apply an even layer. Allow to dry without wiping off and you're done! First, clean your leather surface with GYEON Q2m Leather Cleaner. Apply a moderate amount of product with the attached suede applicator. Be sure to apply even application. Leave the surface to dry without wiping off. Enjoy fully coated, protected, and shielded leather! Need to use to understand the protection and the soft feeling of this coating. Did not work per expectations.. I bought this for my car with white/tan nappa leather seats. The problem I have with them is a constant transference of color from clothing to the seats (blue jeans are the worst). And cleaning required two different products (a cleaner and conditioner) only to have to repeat this a few days later. It was suggested to me by multiple different sources that a protectant would work to seal the seats and Gyeon Q2 was highly recommended. I thoroughly cleaned the seats and then applied the protectant as per instructions and videos I watched on the product. Overall the protectant works.. for a few weeks.. there's still transference but it's easier to clean up the seats than prior to the application of the protectant. The bigger problem is that the protectant seems to wear off and need reapplication after a few weeks. Granted I don't expect it to last forever but given the cost of the product I would have expected it to last longer than that. Easy to apply. Keeps the same factory finish of my Katzkin Leather I just had installed. Didn't change the blue stitching or the Lexus logo stitched on the seats. So far so good and I am excited that the leather is protected and will stay mew looking. Used it on my BMW seats and some dining room chairs. It doesn't change the appearance significantly, but it's a little slick initially. It feels like a great layer of protection. The water beading is incredible.